Belle Fourche Lions have been active in our community since 1936, helping make Belle Fourche an even better place to live, work, and raise a family. But our local organization is part of something bigger. We are one of more than 33,000 Lions Clubs around the world. We share the mission of our 1.3 million colleagues in more than 200 countries. The mission of Lions is to empower volunteers to serve their communities, meet humanitarian needs, encourage peace and promote international understanding. We take pride in our local accomplishments, while we join forces with fellow Lions to make our world a better place. These Belle Fourche Lions recently (okay, this is admittedly a photo from the archives!) attended the South Dakota Lions Convention. We'll begin posting more current pictures and information as it's made available. Shown in this shot, left to right, are Lions Al Shaw, Bill Kunerth, Rich Drabek, Gerald Keil, and Bob Morris. 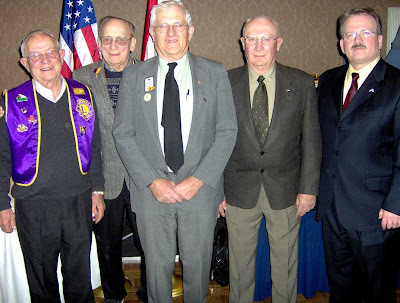 The Belle Fourche Lions Club meets at 7:00 p.m. on the second and fourth Thursdays of each month at the Belle Fourche Country Club. While formal meetings are suspended during the summer months, mission-oriented projected continue.